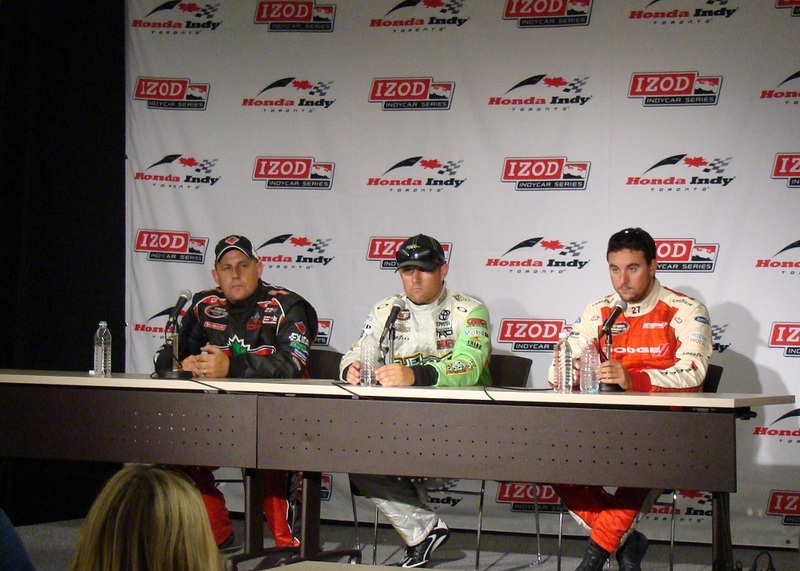 Running on the same schedule along with temporary race course as high-speed open wheel and exotic sports cars for the 2011 Honda Indy Toronto, the NASCAR Canadian Tire Series provides a distinct presence. While the V-8 powered, fiberglass-bodied stock cars appeared quite unusual careening through the streets of Toronto, the show provided last year by these cars as well as their respective drivers brought a high amount of bumping and banging for track position. For the 2011 race, Friday track activities for the NASCAR Canadian Tire Series kicked off with a calamity-filled just past noon time. Throughout the session, several drivers including Mark Dilley and Kerry Micks suffered teething problems with their race cars. 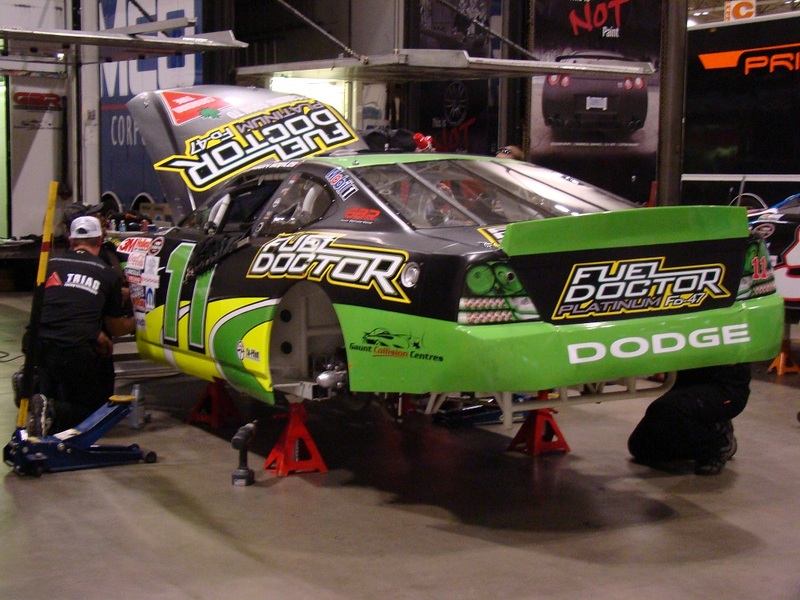 While one incident of contact saw the #17 Dodge of defending series champion DJ Kennington around in the infamous turn 3 hairpin, a more damaging hit involved the 2011 NASCAR Canadian Tire Series' leading rookie of the year contender. The #15 Ford of Steve Matthews spun on the entry to turn 9 hitting the tire wall. Resulting in rear damage with impact to the track barrier, the damage with more greatly affected when another vehicle slammed into the reversing Matthews. Unable to stop in time, the second vehicle crashed hard mangling his stock car's front end. When qualifying Prevailing most convincing in the Friday midday practice session was the defending winner on the streets of Toronto. The #27 Dodge of Andrew Ranger lapped the 1.764-mile street course in 13 minute, 16.336 seconds. Half a second faster than the second place in the session, the young Canadian road racing ace gained the higher hand over the #11 car of Jason Bowles and Scott Steckly. 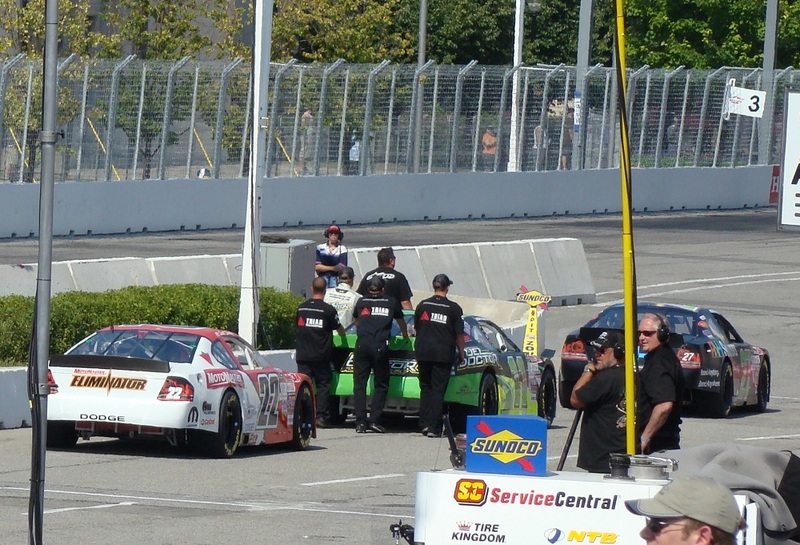 During the afternoon, NASCAR Canadian Tire Series teams were busy to repair damaged machines as they prepared for a later qualfying for the Streets of Toronto 100. A transmission was replaced on the #9 Dodge of Mark Dilley's and of course the rear crash damage on Steve Matthews' car was quickly remedied. By the time qualifying commenced, 30 of the NASCAR Canadian Tire Series season-high 33-car entry list competed for top time. Divided into two qualifying groups, it was the latter group that contained the fierce battle for the Streets of Toronto 100 pole. Andrew Ranger, Jason Bowles and Scott Steckly stormed onto the temporary road course set for a three-way duel. Posting top time first, Andrew Ranger's #27 Dodge practically attacked the circuit driven on the edge of control. Ranger skill would prove difficult to overcome in the early stage of the session until the #11 Fuel Doctor car of Jason Bowles knocked the #27 from the top of the grid. Containing the faster of the NASCAR Canadian Tire series stock cars that practiced earlier, another threat for the Streets of Toronto 100 pole could have been the ICAR winner Robin Buck. Driving the #66 Quaker State/Durabody Dodge, Buck was overaggressive in his attempt at a top qualifying time ended as the car slid sideways into the tire barrier. With a fastest time of 1 minute, 15.260 seconds, Jason Bowles will start the Streets of Toronto 100. Reigning victor of the race Andrew Ranger starts alongside Bowles on the front row. Last season, those two drivers fought the final laps at Circuit Gilles Villeneuve in August. As Bowles led into the final corners of that Napa 100, Ranger wrestled his way to the 2010 race victory. The first race the combatants met this season in the NASCAR Canadian Tire Series, the past sets up an interesting precursor to what can be seen on the start of Saturday's Streets of Toronto 100 event. Behind the Bowles/Ranger front row, Scott Steckly, Kerry Micks and Don Thomson Jr round out the top-5 for the Streets of Toronto 100 Saturday. Other notables starting the road race includes DJ Kennington starting 6th, Robin Buck 7th, JR Fitzpatrick in 9th, Steve Matthews in 17th spot, and Jason Hathaway starting 22nd.